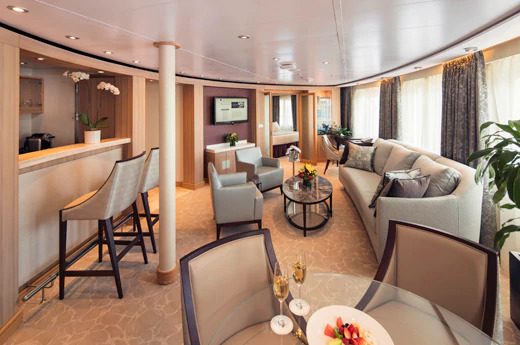 Seabourn Quest excels at creating a sophisticated, yet relaxed environment across her 11 elegant decks. 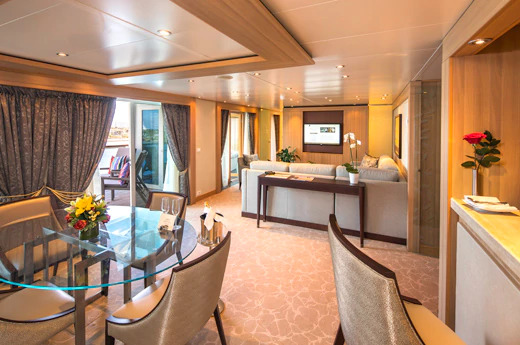 Like her sister ships, the Seabourn Quest has one of the highest space-per-guest ratios in the industry, so there is no sense of feeling crowded anywhere on this spacious liner. 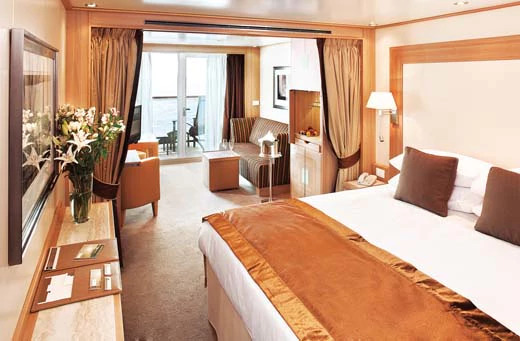 Seabourn Quest is the second in a new class of ships for Seabourn, accommodating just 450 guests in 225 luxury suites. Light décor, subtle colours and sumptuous soft furnishings create a comforting and chic boutique hotel feel. Three dining venues and a pool-side grill ensure you are never far from delicious, fresh cuisine and the pleasing social spaces retain a special club-like atmosphere. 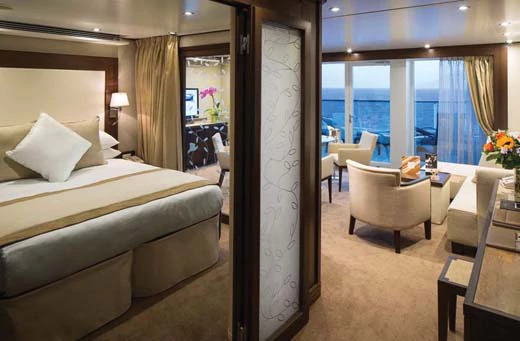 For those seeking a tranquil voyage, Seabourn Quest features the largest spa on any cruise ship, whilst two outdoor swimming pools and organised water sports ensure there are plenty of opportunities for those who enjoy keeping active. Warm and gracious crew members exceed all expectations by anticipating your every need. 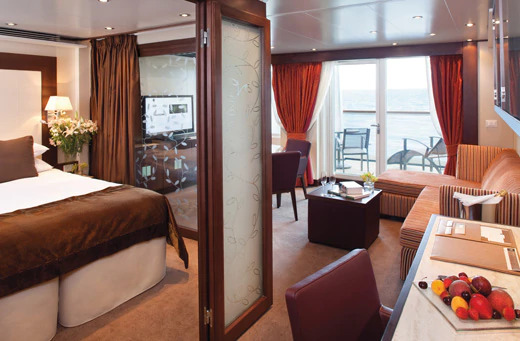 Seabourn Quest offers fantastic choice in accommodation, all beautifully presented and tastefully decorated in cream and chocolate tones. Choose from 225 ocean view suites, 197 of which have their own private verandas. With 7 types of suite in the range, each cabin has a walk-in closet with a safe and is equipped with an interactive, flat-screen TV and a fantastic variety of music and movies. Wintergarden Suites offer the greatest luxury, featuring large windows with ocean views, sweeping curved sofas, dining for six, and a lavish bathroom with whirlpool bathtub. Signature Suites and Owner's Suites boast huge, wraparound balconies and are perfect spaces for entertaining. 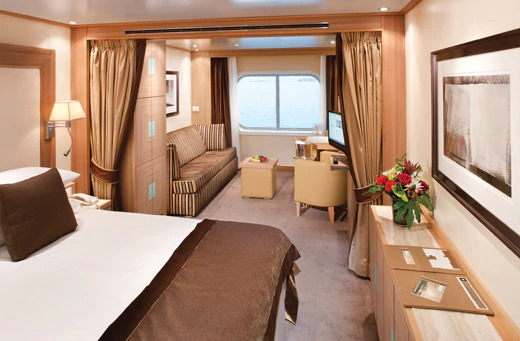 Verandah Suites and Ocean View Suites have a warm and contemporary feel that will become your own relaxing retreat at sea. Enjoy fresh, flavourful ingredients expertly combined and presented in The Restaurant, the ship’s main dining venue. This refined setting of brilliant white linens, gleaming alabaster walls, flowing sheer fabrics and shimmering crystal chandeliers adds a sense of occasion to every mealtime. Each dish is carefully prepared and presented with superb attention to detail. Typical options include seafood tempura, and grilled filet mignon, alongside comforting pasta and classic steak dishes. For food that is extra-special, savour sensational seven-course tasting menus at the ship’s colourful dining venue, Restaurant 2. This exciting setting seats up to 50 guests for creative and adventurous dining, including tapas-sized portions of seared tuna with watermelon, spiced halibut with foie gras and pan-seared quail breast. The Colonnade is the ship's superb casual restaurant, offering both buffet and waiter-service options. Each evening, the Colonnade transforms into a different themed bistro-style restaurant, serving up hearty Italian dishes, fine French cuisine and lively Mediterranean flavours. The pool-side Patio Grill offers more casual fare, such as pizza, burgers and chips, with ample seating on the outdoor decked area. All dining options are complimentary, with the added choice of dining in the privacy of your suite with superb 24-hour room service. The excellent Grand Salon is the main entertainment venue, where guests will find interesting lectures, cooking demonstrations, and movie screenings during the day, and live music, dancing, cabaret performances, comedy, and classical recitals, at night. Located below the Grand Salon, The Club is a lively, modern nightclub where the large dancefloor and comprehensive bar guarantee a party atmosphere every night. Soak up the atmosphere and try your hand at blackjack, roulette, or poker in The Casino. When the captain anchors and deploys the water sports Marina, guests can take to the warm sea to enjoy boardsailing, water-skiing, kayaking, banana boat rides and pedal boating right from the ship. Guests can also swim safely in a separate enclosed area. 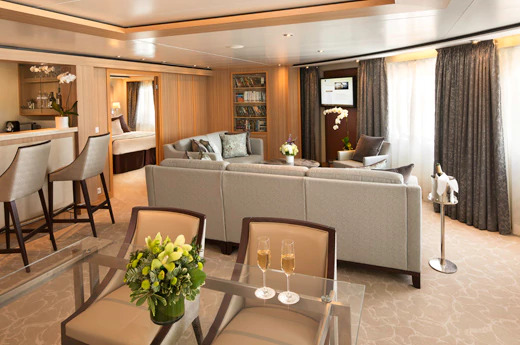 The Observation Lounge on deck 10 is a fantastic spot to take photographs or admire the panoramic ocean views. If it's a warm evening, you might be tempted to forgo the indoor bars altogether and sit out at the Sky Bar to enjoy the night air. Seabourn Square on deck 7, is the relaxed social lounge of the ship, providing a welcoming and comfortable meeting place with cosy sofas, comfortable chairs and cocktail tables. Catch up with new-found friends over coffee and pastries, or browse the library of books lining the walls. 8 online computers are available for guests to use, and if you require anything else, helpful Guest Services Specialists sit discreetly at individual desks, happy to share tips and advice, and assist with booking tickets for shore excursions, or anything else you may need. Featuring the largest spa facility on any luxury cruise ship, ultimate relaxation is practically guaranteed, with six treatment rooms, a thermal area featuring a large hydro-pool, dry float, sauna and steam rooms, and full-service salon. The well-equipped gym and a motion studio feature a Kinesis Wall and Thai massage area. Get involved with the many group classes, including Kinesis training, Yoga and Tai Chi at no extra fee. All Penthouse Spa Suite feature dining table for two to four. Separate bedroom. Glass door to veranda. Two flat-screen TVs. Fully stocked bar. Spacious bathroom with tub and shower. Large vanity. All Veranda Suites feature a full-length window and glass door to private veranda. Comfortable living area. Queen-size bed or two twin beds. Dining table for two. Walk-in closet. Interactive flat-screen television. Fully stocked bar and refrigerator. Makeup vanity. Spacious bathroom with separate tub and shower. Veranda railings are part metal and glass from floor to teak rail. Wintergarden Suites feature large windows. Dining for six. Whirlpool bathtub. Guest bath. Convertible sofa-bed for one. Pantry with wet bar. Glass-enclose solarium with tub and day bed. Two closets. Two flat-screen TVs. Complimentary internet/Wi-Fi service.